I'm in a REALLY good mood today (for some reason) and figured I'd better celebrate it while it lasts. Sooo, I just want to post real quick with a couple of Yay's! Yay for my husband who woke me so sweetly ;) this morning! Yay for Mellow Mushroom's Gourmet White that I had for lunch (YUM!) ! Yay for a weekend with very few plans! Yay for good friends who call when they're in Florida and can pick you up really good beer! Yay for warmer weather that means I can get in the water soon! Yay for the beautiful azaleas and wisteria that are blooming all over lower Alabama right now! Yay for a brighter outlook on life! Yay for you visiting my blog! 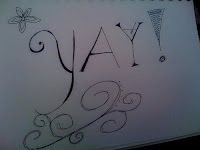 I want to add a reminder to look for and celebrate all the little Yay's in your life too!! OK, I have to admit: my body sort of "jumped" when I saw the headline on MSNBC about the NKOTB reunion!